A sparkly little halter top, knit in a stretchy and easy lace pattern. This will fit a variety of medium-ish sizes and shapes; halter ties make the neckline very adjustable, the back has a 2 x 2 rib panel, and the wave lace is very accommodating. Knit in one piece, from the ties down; the bust and empire styling is done with short rows for a curvy fit, then back is cast on and joined for knitting in the round to the hem. 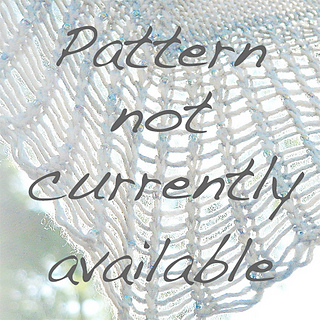 This pattern is no longer available, but I may work on a multi-sized version in future. For other designs available as individual downloads, please visit my designer page The Knitting Vortex.